Paul Cook joined the Mini Super Twos category in 2016 and won his first Final in June this year, taking a decisive victory at Northampton International Raceway. 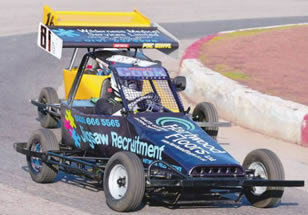 With the support of several local businesses Paul has become a regular competitor and progressed to become one of the formula's front running drivers. We sat down with Paul after the National Championship meeting at Yarmouth to find out how more. Mini Super Twos webmaster: Hi Paul, its the day after our National Championship race at Yarmouth. Can you tell us how the meeting went for you? Paul: "Given my previous form at Yarmouth Stadium I’m pretty happy with how the day went! I think its the best result I’ve had at Yarmouth this year and with almost double the amount of cars on the grid for this particular meeting I can't complain at all!" Mini Super Twos webmaster: Did you have a pre-race strategy in your mind before the start? Or at least one you can share with us? Paul: "I did make some changes [to the car] for this meeting. I tried something very different with tyre pressures in practice but didn’t get the chance to test it properly due to the spring on the throttle return breaking. The car was stuck on full throttle but I took the gamble on using those new pressures for the main race. Although there was no obvious difference in how the car felt the lap times seem to suggest that it worked and produced good results." Mini Super Twos webmaster: You've enjoyed some strong results this year. Would the Northampton meeting be your highlight so far? Paul: "I managed my first win at Northampton. It wasn’t gifted and I had to fight #515 Craig Driscoll for it. Other drivers found the track tricky but it just seemed to suit my setup and driving style. I would have to say that my highlight would be our British Championship at Aldershot in June, coming from the length of the straight to catch the leaders and finishing in third place was very rewarding." Mini Super Twos webmaster: How did you get involved with the Mini Super Twos? 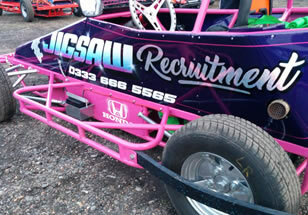 Did you have any previous racing experience? Paul: "I come from a racing family and have always been involved in the sport. At 15 I first raced on dirt ovals and then a few years later dabbled with Motocross and track days at Snetterton on sports bikes. I also help as a scrutineer for Spedeworth with my father Darrell Cook. It was working as a scrutineer at Yarmouth stadium that I first saw the Mini Super Twos and got chatting with John Smith [founder of the Mini Super Twos] and decided to buy a car." Mini Super Twos webmaster: Do you have a favourite track and, if so, why? Either one currently visited by Mini Super Twos or one you have driven on before. Paul: "I would have to say its between two tracks- Northampton where I went well and got my first win and Aldershot which I think suits our formula perfectly." Mini Super Twos webmaster: Whats your day-to-day job? Paul: "I work at the port of Felixstowe." Mini Super Twos webmaster: Do you have any racing heroes (Stock cars, Formula 1, motorbikes)? Paul: "I don’t have any racing heroes but there are certainly drivers that I admire for what they've achieved and their driving ability. Growing up I travelled the country with my Dad racing every weekend where I learned alot and had some success." Mini Super Twos webmaster: You have several company names painted on the side of your Mini Super Twos car. The car looks fantastic. Could you tell us about your sponsors? Paul: "I was lucky enough to get some support at the very beginning to help with the cost of the initial outlay when I started racing the Mini Super Twos. I'm sponsored by Jigsaw Recruitment Services, Oaks Caravans, Ipswich Carpet and Flooring Services and Wilderness Medical Services. Sponsorship is very important in oval racing and I’m very grateful for all of the help I've had. Even though we have some meetings left this year we're already looking forward to 2018! "I would also like to take the opportunity to thank JS Plant Hire, John Smith and his family for all of the advice and help over the last year. I've had a fantastic time and its great to see the formula growing with a great group of drivers."